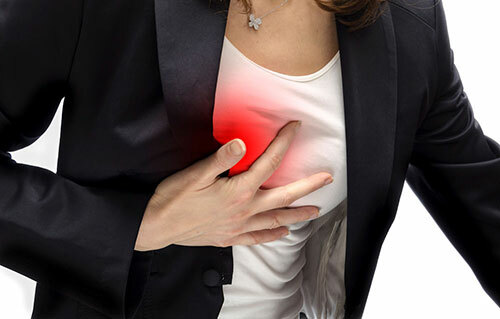 Heart attacks have become one of the most common causes of early deaths in today’s world, and a large percentage of people suffer from cardiac problems and heart-related ailments. Among the major causes of heart attacks are unhealthy eating, sedentary lifestyle, increased stress and lack of physical activities. While many believe that a heart attack is sudden, and there are no symptoms which one can watch for. Though, high blood pressure, increased cholesterol are some of the health issues which can lead to heart attack or stroke, but, there are no specific symptoms of heart attack. However, this is not completely true. There are some early signs and symptoms sent by our body which indicate a potential risk of a heart attack. While there are some common signs, but, then, there are a few symptoms which can only be seen in women. Here are the top 6 symptoms of heart attack that all women must know about. Sometimes just before the heart attack, women may feel the signs of severe heartburn, flu or poisoning. One might also feel severe pressure in the abdomen region, which some women have also described as a feeling of an elephant sitting on the stomach. The sudden occurrence of dizziness and shortness of breath, where you feel that you are unable to breathe is also considered as an early warning sign of a potential heart attack. The women who experienced this and survived the heart attack said that they felt as if they have run a marathon. Pain, discomfort in the chest, feeling of burn or excessive pressure is often associated with the occurrence of heart attack. These symptoms may occur in men also. While some may experience pain on the left side of the chest or in the entire chest region. If the pressure or pain does not disappear within a couple of minutes, call your doctor immediately. If you feel tired or fatigued even after taking a long rest, then, you must understand that something’s wrong. If you feel that you are not even able to do the most basic chores, then this is an alarming sign which should not be ignored. Cold sweat is one of the other common symptoms experienced by women. While sometimes the cold sweat is connected with stress or any other heart ailment, but again, you must not take it lightly, and get your ECG done or consult your doctor. While experiencing pain in these areas is quite common, and there may be several other reasons behind the pain, but, if the pain in any of these areas is accompanied by pain in the left arm or chest, then it is a warning sign. Sometimes this pain may not be accompanied by the one in the chest or left arm, and thus, it may confuse you. This pain might be progressive, sudden, acute or nagging. It may even wake you up in the middle of the night. So, if you are experiencing such a pain, and not sure about why it’s happening, it’s always a good idea to consult your doctor. While these signs do not surely indicate a heart attack, but, if one or more of these symptoms are experienced frequently, you must get yourself diagnosed by the physician. Prevention is always better than cure!! !